A theme overflowing with science facts and lessons, simple recipe ideas, and arts & crafts suggestions! 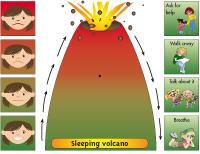 Display the club's sleeping volcano to help children understand and manage their frustrations. 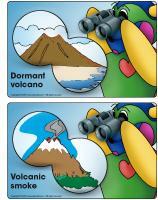 (Open thematic poster-Volcanoes) Print, laminate, and decorate the walls of your daycare with all kinds of posters. 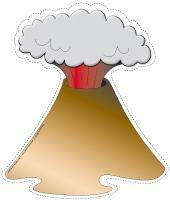 (Open educa-decorate-Volcanoes) Print, cut out, and laminate. Use the illustrations to decorate the walls of your daycare or hang them from the ceiling to set the mood for your theme. 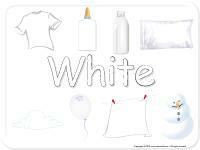 (Open educ-poster-White) Print and laminate the poster. Display it and use it to explore the color with your group. (Open Poni presents-A volcano) Print and laminate. Display on a wall near your circle time area and use the document to teach children about volcanoes. Do you know what a volcano is? Do you think a volcano is hot or cold? How do we stop a fire? Can this work with a volcano too? During circle time, show children a smoke detector. Press on the button so that children can hear the sound it produces. Ask them what this sound means and what they must do if they ever hear this sound. The pictures may be used as a memory game or to spark a conversation with your group. Use them to decorate your daycare or a specific thematic corner. 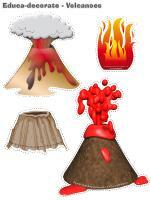 (Open picture game-Volcanoes) Print, laminate, and store in a Ziploc bag or in your thematic bin. 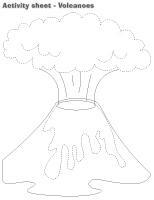 (Open writing activities-V like volcano) Print for each child or laminate for use with a dry-erase marker. 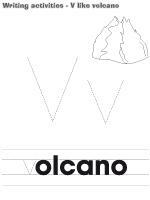 (Open stationery-Volcanoes) Print. Stationery is available with each theme. It may be used to communicate with parents, in your writing area, or to identify your thematic bins. Make all figurines and vehicles (ambulances, police car, tow truck, taxi, etc.) related to firemen and emergencies available for your group. Use an old hose to create a path for cars. The path can easily be moved to another location or modified. Houses and figurines... children can pretend they are saving the figurines from a fire. Red paper and fireman helmet models which can be traced and cut out. Coloring pages related to the theme which can be cut out. Use plastic bottles to create your own oxygen tanks. Make your own fire extinguishers. Use paint or construction paper for a fire craft. Fireman, policeman, or ambulance driver costumes and helmets. Old hoses or foam noodles (for swimming pools). Plastic axes (can be found in the Halloween section in stores). Pretend oxygen bottles (plastic water bottles). Memory game related to the theme or fire safety. Red, yellow, and orange modeling dough to represent fire. Laminated picture game related to fire safety. Picture game illustrating "hot" and "cold" items. Sequential story reviewing the steps involved in a fire drill or if our clothes catch fire. Books about firemen and other related professions (policeman, ambulance driver, etc.). Radio and headphones for listening to siren sounds. Volcano experiment (vinegar and baking soda). The flashcards may be used to spark a conversation with your group, in your reading and writing area, or to identify your thematic bins. 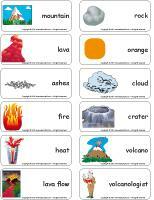 (Open word flashcards-Volcanoes) mountain, lava, ashes, fire, heat, lava flow, rock, orange, cloud, crater, volcano, volcanologist. 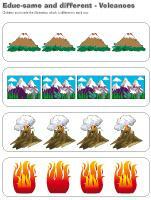 (Open sequential story-Volcanoes) Print and laminate the cards. Have children place them in the correct order to recreate the story. 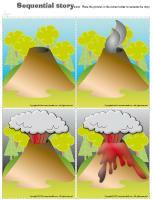 (Open educa-decorate-Volcanoes) Print and laminate the illustrations. Make a hole at the top of each one and hang them from a hanger above your changing table. If you prefer, you may use a plastic lid (used to avoid spatter in a microwave oven). Simply hang illustrations all the way around the lid. Add strips of red and orange crepe paper or ribbon to represent fire. Offer several red and orange toys to help little ones discover these colors. (Open lacing-Volcano) Print, trace the models on cardboard, and cut out. Punch holes around the contour of each shape and let children thread a shoelace through the holes. Create a volcanic obstacle course by depositing orange pieces of construction paper on the floor to represent lava. Children must hop over the lava. You may also secure grey-coloured pieces of construction paper on the floor to represent volcanic rocks. Children must hop on these to avoid getting burned. Black garbage bags cut into strips and hung from a table or doorway can represent clouds of smoke children must crawl through while pieces of blue construction paper can represent water, their final destination where they will be safe. Have children pretend their clothes have caught fire. Show them how to stop, drop, and roll to put the fire out. Firemen must be in very good shape to put out fires, especially volcanoes. Lay exercise mats on the floor and encourage children to perform somersaults, jump, stretch, etc. Transform your sandbox into a volcanic territory. Have children build craters and fill them with water. Go for a walk with your group and visit a playground or wooded area. Children become volcanologists. Give them each a bag or small container they can use to collect their findings. When you return to the daycare, examine them together. Offering magnifying glasses will make the activity even more attractive for children. Draw a path which includes a start and finish line. When you say "go", two firemen (children) race against a volcano. Hang an old blanket from the ceiling to represent smoke. Children must crawl under it. Lay exercise mats or foam noodles on the floor to represent a ladder. Children must hop over them. Have a bucket of water waiting for each child. They must carry their bucket of water from one predetermined location to another, without spilling the water. The first child to complete all the obstacles can race with another child. You will need a drum, tam-tam, or just a pot and a wooden spoon. Children slowly walk around the daycare. When you gently tap on your drum, children hop lightly. When you hit your drum a little harder, children must jump higher. Finally, when you hit the drum really hard, children must jump as high as they can and roar to represent a volcanic eruption. Variation: You may do this activity using three different drums. Associate a different movement to each drum. (Open educ-shadows-Volcanoes) Print and laminate for durable, eco-friendly use. Children must draw a line between each illustration and its shadow using a dry-erase marker. 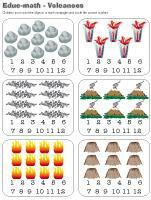 (Open educ-math-Volcanoes) Print and laminate for durable, eco-friendly use. Children must count the objects in each rectangle and circle the corresponding number. (Open educ-same and different-Volcanoes) Print and laminate for durable, eco-friendly use. Children must circle the illustration which is different in each row. (Open educ-ascending-descending-Volcanoes) Print and laminate. Children must place matching illustrations in ascending or descending order. (Open magnetic memory game-Volcanoes) Print two copies of each illustration. Glue each illustration to the top of a frozen juice can. Attach a magnet to the end of a fishing rod (or a stick with a string attached). Place the cards face down on the floor. Using the fishing rod, a child picks two illustrations. If they are identical, he may keep them and play again. If they are not a match, his turn is over. Let families express their creativity. Invite them to create a small volcano together. If you wish, send a small bag containing a variety of arts & crafts materials home with each child. Display the volcanoes on cubbyholes or on a shelf. You can even offer a prize for the most original volcano. During your Monday morning circle time, ask children to tell you about their weekend. Each time a child recounts an event, fact, or activity, the other children applaud. This simple activity will help children feel special and appreciated (for most). Respect any child who does not want to be applauded, but try to gently help him/her appreciate this special moment. This activity can also be done during your afternoon snack time. Have each child talk about an action, fact, or event which occurred during the day. (Open sleeping volcano) Print and laminate. Cut out the two arrows and secure them loosely with fasteners so that children can turn them. Display the volcano in your relaxation area. When a child is upset or angry, show him the sleeping volcano. Use it as a tool to help children understand their anger. With the arrow, children can visually show you the degree of their anger. Once children understand the concept, they will be able to refer to the volcano on their own when they are frustrated or upset. Fill a bin with items children may use to pretend they are volcanologists: shirt, safari-style hat, binoculars, backpack, accessories (water bottle, compass, camera, etc. ), map, magnifying glasses, pictures of volcanoes, etc. Put a spin on the traditional "Simon says" game. Give children instructions. They must act them out only if you say "The fireman says" first. You can, for example, ask children to roll on the floor, climb a ladder, put out the fire, etc. Make homemade modeling dough and ask each child to sculpt a volcano (they may need your help). Give each child 1 teaspoon of baking soda and a ½ cup of white vinegar (with a few drops of orange or red food coloring). Children pour the baking soda in their volcano's cavity. When you give them the signal, they must pour the vinegar on top. They will love to see their volcanoes erupt! Variation: You may also choose to make one giant volcano for the group and demonstrate the volcano eruption for children. The result will be spectacular! Use several different candles to show children how the heat produced by fire can melt wax, make it turn into a liquid which then becomes a solid once again upon cooling. Simply light the candles and let wax drip on waxed paper. You must perform all manipulations once the candles are lit. Which colors can we see in fire? Children will identify the following colors: yellow, red, and orange. Tell children that you don't have orange paint. Give them each a small amount of red paint and a small amount of yellow paint. Let them mix the colors together. What happens? They will be surprised to see that once the two colors are mixed together, they will have orange paint. Have them try to reproduce orange using markers, wooden pencils, waxed crayons, etc. Use the orange paint for a craft. Fill a sensory bin with yellow, red, or orange pieces of paper, cardboard, fabric, etc. Let children manipulate them, tear them, crumple them, etc. Give each child a bowl of chocolate pudding. Have them press an ice cream cone in the centre of their bowl (with the pointy tip on top). Use orange or red icing to completely cover the cone. Children will enjoy eating their erupting volcano at snack time. Grate carrots (if you wish, add cabbage, celeriac, etc.) to represent fire. Add raisins and a small amount of mayonnaise. Serve as a snack. Prepare red, yellow, and orange Jell-O and cut it into cubes. Deposit the cubes in individual bowls. Tell children they are eating lava. If you wish, add a touch of whipped cream to "cool" the volcano. Draw a volcano crater on a large piece of white paper. Invite children to work together to make the volcano look like it's erupting. They can, for example, add colored pieces of paper, cardboard scraps, ashes (torn newspaper), etc. Put a few drops of red and yellow paint on a sheet of paper and encourage children to blow on the paint using a drinking straw. The paint will spread and the end result will be a beautiful fire. 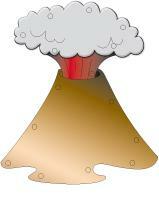 (Open models-volcano) Print, cut out, and glue the volcano on a piece of cardboard or construction paper. Ask children to use crepe paper, scraps of cardboard or tissue paper to add lava. Encourage them to be creative. No two volcanoes will look the same. Take a walk with your group and collect rocks and stones. Transform them to make them look like volcanic rocks. Paint them using a variety of different colors and add glitter to your paint (Epsom salts or condensed milk) to give them a magical look. Use aluminum paper to create a volcano around a Styrofoam or cardboard glass (the opening will be the volcano's crater). Roll out a ball of modeling dough (like a pie crust) and use it to cover your volcano. Make a hole in the centre. Children may decorate the volcano with pipe cleaners, plastic trees, rocks, etc. Variation: This volcano may be used for the scientific experiment mentioned in the early science section. 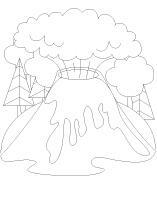 (Open coloring pages theme-Volcanoes) Print for each child. (Open creative coloring-Volcanoes) Print for each child. Invite children to draw an erupting volcano.